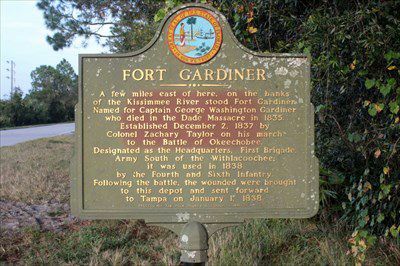 Fort Gardiner, Florida was established on the banks of the Kissimmee River in Polk County in December 1837 during the Second Seminole War. It was established by Colonel Zachary Taylor who was on his way to Lake Okeechobee to round up Seminole Indians resisting removal. It was named for Captain George Washington Gardiner who died in the Dade Massacre in 1835. The crude log stockade was built on the east side of the Kissimmee River between Lakes Hatchineha and Kissimmee. It included two-story blockhouses at diagonal corners surrounded by a stockade of 18-foot logs, with a storehouse, mobile cannons and a powder magazine in the middle. It was designated as the headquarters of the First Brigade of the Army south of the Withlacoochee River. After the Battle of Lake Okeechobee on December 25, 1837, the wounded were brought to the fort. Like many forts of the Seminole Wars, it wasn’t occupied long and was all but abandoned once soldiers realized they couldn’t build a road through the swampland to the east. There are no remains today. Compiled by Kathy Weiser-Alexander, updated October 2018.